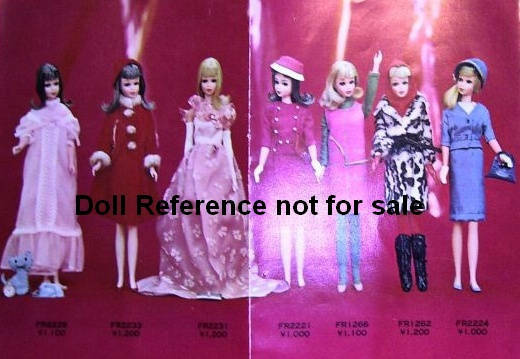 While many of the USA outfits sold for the 11 1/4" tall Francie doll and other same sized friends were the same in the Japan market, there were some outfits sold exclusively in the Japanese market or the outfits were slightly different than the outfit sold in the USA. That makes these clothing and accessory items both rare and costly. Francie doll, DS2240 Ball Gown 1967, this is probably the most glamorous full length gown created for the Francie sized dolls, it is made from a gold and white brocade fabric with a halter top that ties at the neck, full orangish red taffeta underskirt with big ruffles that showed in front, as the brocade fabric is slightly shorter than the full length in back, an orange sash that tied in back at the waist, white plastic clutch purse, short white tricot gloves, graduated pearl necklace, low soft white heels & an eyelash brush. This outfit was only sold in the Japanese market. 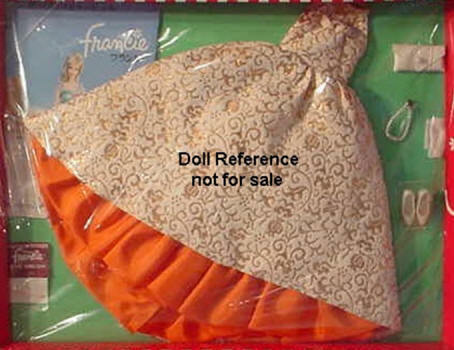 The brocade fabric used for Francie's gorgeous gown is the same that was used in both Barbie's 911 Golden Girl 1959-1962 and 961 Evening Splendor 1959-1962 outfits, however, it has now been turned inside out. Amazing that they had any fabric left over after four years of producing those two outfits. Francie doll, Plantation Belle outfit for the Japanese market. The dress is modeled after Barbie's # 966 Plantation Belle outfit (1959-1961) in a pastel pink and blue floral print on a white background with rows of white lace and white soutache braid on the round full skirt, white tulle half slip for fullness, green and wheat straw hat with a green ribbon, long white tricot gloves, white low closed toe pumps and a green plastic hatbox with red, white and blue stickers - that have Rome, London and Paris on the front. This outfit was not available outside of the Japanese market, exact date of issue is unknown ca. 1960s. 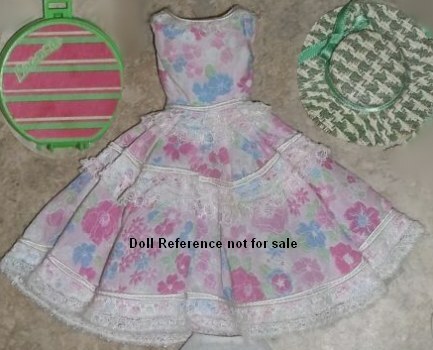 Barbie also had a similar floral Plantation Belle outfit, also exclusive to the Japan market.